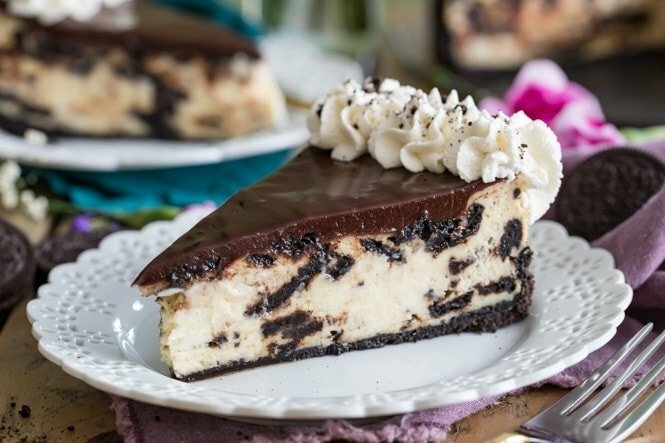 A creamy, cookies & cream filled Oreo Cheesecake! 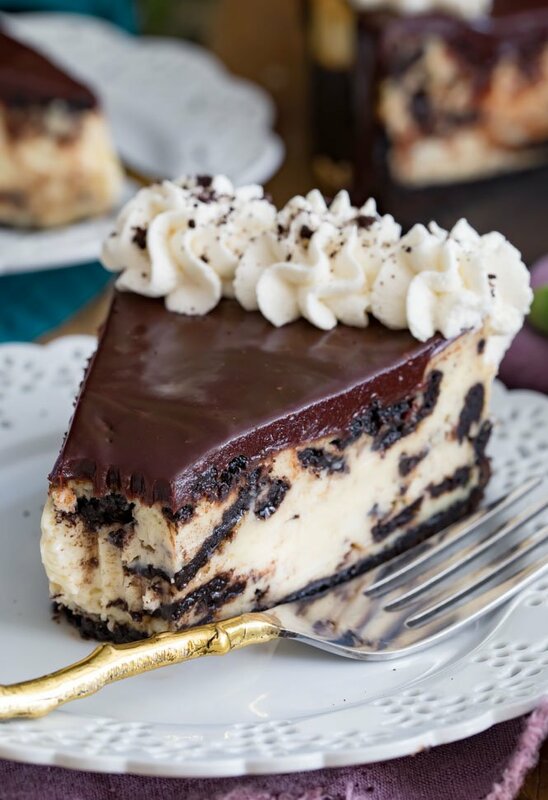 Served on an easy Oreo crust recipe and topped off with chocolate ganache and my homemade whipped cream, this cheesecake is not only a looker, it’s also so easy to make and is utterly irresistible! I get asked often what my favorite dessert is, and for someone who is asked so frequently and who spends so much time around desserts, there’s really no excuse for the fact that I never have an answer ready. I mean, it’s tough, and honestly my “favorite” changes from week to week. Often it’s my chocolate chip cookies. Sometimes it’s my Pineapple Upside-Down Cake, and sometimes it’s something not even on the blog, like a box of Girl Scout Cookies or a scoop of ice cream from the local ice cream shop. I guess I’m not much of a dessert loyalist. 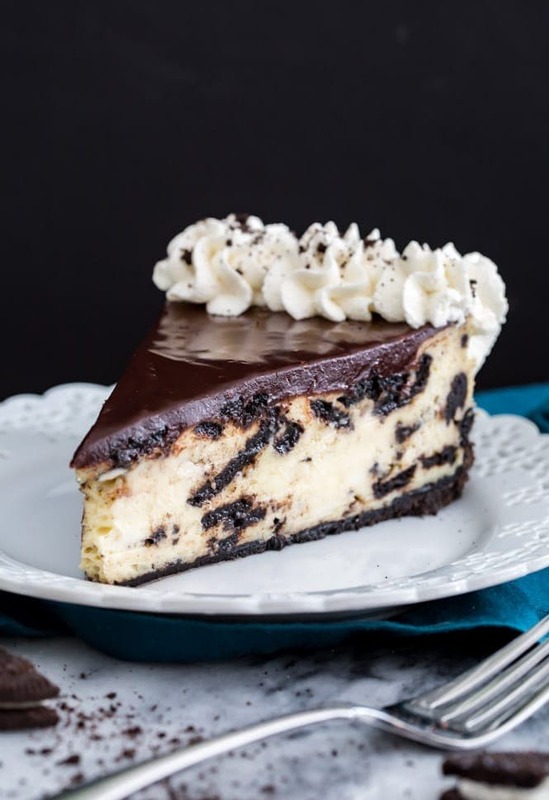 But ever since perfecting this Oreo Cheesecake recipe, the answer has been crystal clear… for now and for all of the foreseeable future, my favorite is definitely this Oreo Cheesecake. 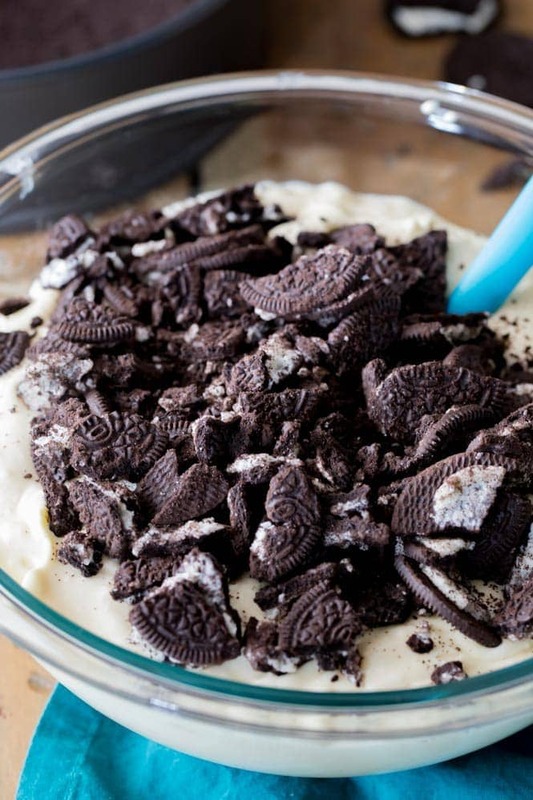 If you’ve ever been intimidated by the thought of making Oreo Cheesecake (or, any kind of cheesecake), don’t be. This recipe is simple and easy and, perhaps best of all, there is no water bath required. I provide plenty of tips below on how to assemble your cheesecake and to make sure it comes out crack free (and exactly what to do if for some reason it doesn’t come out crack free!). Don’t leave out the sour cream! I’ve mentioned this before in my no-bake cheesecake recipe — sour cream is what makes a cheesecake really taste like a cheesecake. This key ingredient gives your dessert that critical depth of flavor. This recipe does not use a water bath, but as some springform pans are known to leak I recommend loosely wrapping the bottom of your springform pan with foil to prevent anything leaking into your oven. 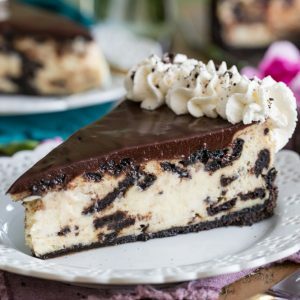 I recommend using my Oreo Crust recipe for this Oreo Cheesecake, but you could also make it on a graham cracker crust. I don’t recommend using a storebought crust, as they are much too small to hold the amount of batter that we’ll be making with this recipe. For best results and a cheesecake that’s not likely to crack, I recommend using all room-temperature ingredients. Set your cream cheese, sour cream, and eggs out to reach room temperature before mixing everything together. Don’t over-beat the eggs! Use your mixer to beat each egg into the batter until just completely combined. Immediately after removing your cheesecake from the oven, run a sharp knife around the inside of the pan to separate the edge from the pan, this will help prevent cracks as the cheesecake cools. While we’re going to try really hard to avoid any cracks, if you end up with them anyway don’t despair! You can easily conceal them with a sweet dark chocolate ganache covering! 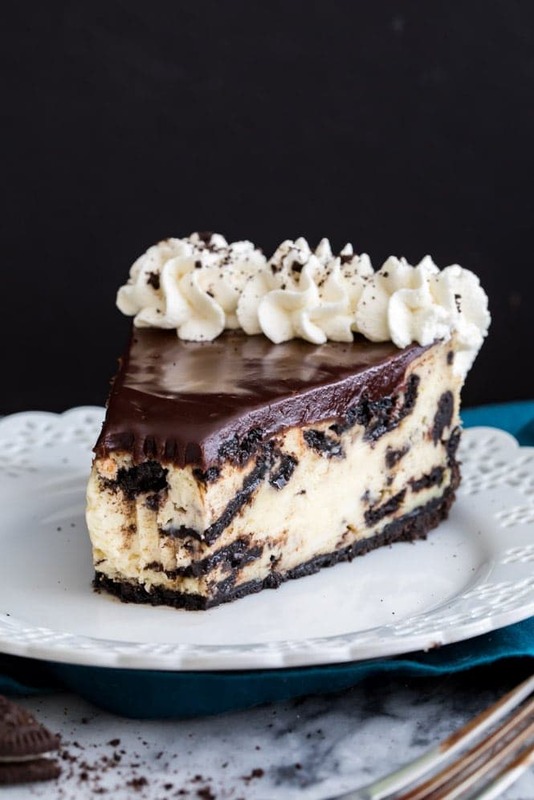 If you like Oreo Cheesecake, you might also like my Oreo Cheesecake Bars, Cheesecake Brownies, or Oreo Balls! A creamy cookies & cream filled Oreo Cheesecake served on an Oreo Crust and topped off with chocolate ganache and homemade whipped cream! This baked cheesecake is so easy to make and includes plenty of tips and tricks for a perfect cheesecake! Using an electric mixer, beat together cream cheese and sugar until creamy and well-combined. Stir in sour cream and vanilla extract. Use a spatula to fold in Oreos. Pour evenly into springform pan over Oreo crust. Bake on 350F for 35-45 minutes or until center is set but springs back to the touch. 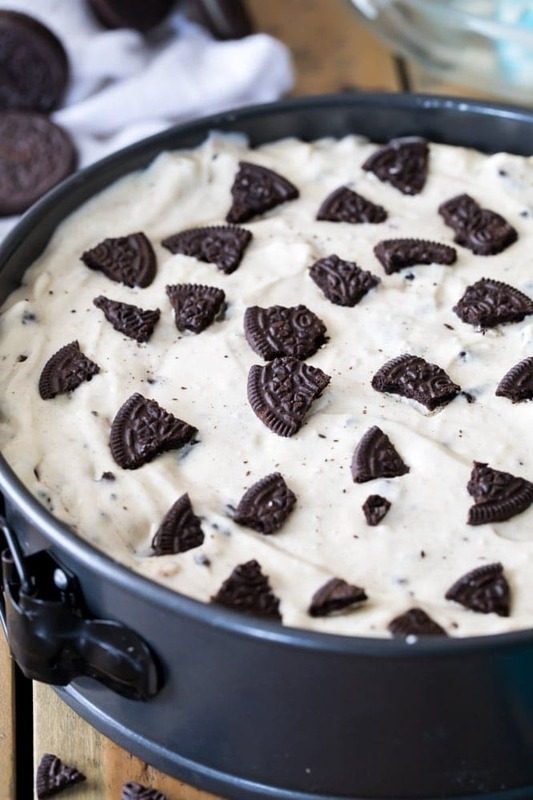 Once Oreo Cheesecake has finished baking, allow it to cool to room temperature for about an hour before placing in the refrigerator to cool and set completely (about 6 hours). Once cheesecake is cooled, you may prepare the chocolate ganache. Combine chocolate chips and heavy cream in a small saucepan over low heat. Stir frequently until chocolate is melted and mixture is smooth. Allow ganache to cool for 10 minutes and then pour evenly over cheesecake. Allow ganache to set before topping with whipped cream (if using) and slicing and serving. If desired, top off with homemade whipped cream and sprinkle with broken cookie pieces. *I place the Oreos in a large ziploc bag and smack them a few times with a rolling pin. You don't want the cookies to be pulverized to tiny crumbs, or they'll just blend into the batter and make a grey cheesecake -- you want to have discernible cookie chunks, so keep that in mind when breaking them and see the photo above int he post for a visual hint. This was some of the best tasting Oreo cheesecake I’ve ever had! I will definitely be making this again. Didn’t do the ganache, we didn’t feel like it needed it. This cheesecake recipe is delicious! The perfect blend of oreos, cream cheese and sweetness, and I think the sour cream made it more fluffy and light tasting then my original recipe that left it out. The reason why I”m giving this recipe a 3-star rating though is because of the chocolate ganache. Obviously cheesecake should be kept refrigerated, so when I put it in the fridge after the ganache was spread over it, I was extremely disappointed to find it hours later with the top as hard as a rock! The chocolate had hardened SO much that my kids were literally knocking on the top of my cheesecake…. they thought it was hilarious of course but I was ready to cry. Not sure why I didn’t think of that before I made it…. I obviously know that melted chocolate chips completely harden when cooled- duh! Thankfully it was just for my family- I ended up being able to cut the chocolate ganache completely OFF the cheesecake in order to stick a fork in it and eat it. Now MAYBE if I had left it out on the counter for the ganache to cool, it would’ve looked like the actual picture posted, but then- who wants room temperature cheesecake and what would you do with the leftovers? I will definitely be making this cheesecake again but NOT the ganache! Hi Tami! Did you use the heavy cream in the ganache? It shouldn’t be hard like that even after hours of refrigeration. The ganache should have been solid but more than easy to slice through with a fork, much like the cheesecake itself. Did you use the cream when melting your chocolate chips? Yes- I followed the recipe you posted. I am glad you otherwise enjoyed the cheesecake, though!! I’m making this recipe now. I’ve made tons of cheesecake, some with ganache and the ganache never hardens like that. It’s more like thick fudge. Also if you really want to know the truth, the proper way to eat cheesecake is at room temperature. The flavors are more pronounced! I’d love to hear how it turns out for you! I’ve never had the ganache harden like that, either, it definitely should be more like a fudge, so I’m wondering if maybe the cream had accidentally been left out. I hope you love the cheesecake, Darlene! Hi Sam, I was worried about the chocolate topping after seeing this comment but it came out perfect for me when I tried it. Oreo cheesecake was perfect and the chocolate was easy to bite into like a fudge. Great recipe I will save this one. I’m so thrilled to hear that it was a success for you, Shelly! Thank you so much for commenting, I really appreciate it.